I am a big fan of fast food chains. Not for love of the food, but because they are unashamed salespeople through and through. They take every opportunity to add an extra dollar onto your bill. I don’t know about you, but nine times out of ten, I take the meal deal – the upsize, the extra hash brown or the large coke. Most times I am not too sure what I want when I get to the counter and they just make it so easy to say, yes, yes, yes! Here are 8 selling techniques you can use in your hospitality venue right now. Cross selling – when you get a customer to spend more money through buying additional products so ordering a slice of cake with a coffee or an entrée with a meal. Upselling – when a client decides to spend more by upgrading the type of product they initially want to purchase. For example, ordering a large pizza instead of a small, or toppers on a steak. Every staff member who has the potential to interact with a customer at any point during their day should view themselves as a salesperson and that includes chefs, administration and security. One of the most challenging issues for managers with selling on the front line is that you need strong people on the front line to ensure the success. DWS offer a comprehensive mystery shopper service to give you the most accurate feedback possible – encompassing food quality, customer service, hygiene and impressions on the environment of your venue. 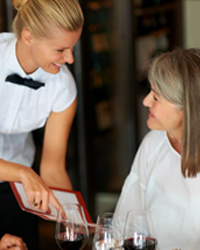 “When it comes to assessing the sales capability of your staff, some of the best secret shopper comments we receive, tend to be where an unexpected member of staff, such as a chef, takes the initiative to speak with the shopper and really sells the menu, asks for feedback after the meal or sneaks in a suggestion of dessert or coffee. Some staff members are natural sales people, but others need to be supplied with the words or a script until they are comfortable in that role. Please do not take this to mean that staff should regurgitate the same line to every customer that comes across their path regardless of day, time or type of customer. That just becomes annoying. For example, I just bought a brand new car and the dealership have taken to sending me an email every month asking if I would like to advantage of their special offer on another brand new car. Now, I am not sure about you, but I do not tend to buy a new car every month – especially one month after buying a new car from that dealership! When it comes to the food and beverage industry, the real key to selling is not just the sales pitch but making a logical and tempting offer that is EASY to accept. Upsell: Before a customer orders, provide a menu and give recommendations for cocktails or special wine selection. When asked for a standard drink, tell the customer which brands you carry. Chances are the customer will go for a higher quality, more expensive brand when prompted. Cross sell: Ask the customers if they want something to eat with their drinks, such as a share plate, appetisers, pizzas, garlic bread. Upsell: Check if they would like a large cup, flavoured syrup or marshmallows. Cross sell: Suggest an accompaniment such as a muffin, a croissant, cake or toast. Upsell: Suggest specific or special dishes, such as the fish of the day, when handing out menus or offer larger portions if available. Cross sell: Suggest drinks or share plates before handing out menus. When taking orders, suggest entrees or sides. After the main dish is cleared, provide a dessert menu. Keep your eyes peeled next month for Part 2. We will share our best tips on how to keep your staff selling now that you have them focused on the task at hand. In the meantime, if you would like to put your staff to the test, give me a call and we can schedule a secret shop with a performance full report. Contact Samantha Litfin on (07) 3878 9355 to find out how the DWS Mystery Shopper program can help refine your venue’s appeal.